Help Your Dog Overcome Mobility Challenges – Starting Today For some dogs, a reduction in physical ability happens quickly. For others, it occurs at birth or arrives with advanced age. Yet with the right help and support, your dog can still enjoy a full life and his canine independence. Sit. Stand. Go! How to help your dog overcome mobility challenges provides the answers you need to jumpstart your dog’s mental and physical activity and restore the joy in his life.In this helpful book written for dog owners, you’ll discover how to:• pay attention to changes in your dog,• recognize challenges created by those changes and• accommodate your dog’s needs to better move through his worldMobility is crucial for any dog. It allows your pet to run, jump and play, but also to eat, groom himself and eliminate unaided. You want your dog to have a full and active life, even if right now he’s not able to do all the things you both would like him to. Sit. Stand. Go! gives you all the practical tools you need to help you and your dog overcome his mobility challenges and improve your dog’s quality of life.Sit. Stand. Go! combines the appealing writing style and attention to detail of Patricia McConnell's The Other End of the Leash with the practical knowledge of From Fearful to Fear Free: A Positive Program to Free Your Dog from Anxiety, Fears, and Phobias by Dr. Marty Becker.In Sit. Stand. Go! author Kate Titus calls on her years of experience working with mobility-challenged dogs to show you how to look at your dog with a fresh perspective, record your observations and present them in a meaningful way to your veterinary team.With Kate’s genuine love for dogs evident on every page, she’ll teach you how to:• recognize changes in your dog’s mobility,• provide assistance or assistive equipment without triggering your dog’s stubborn streak,• capture and present important information about your dog’s current mobility and changes you’ve seen since your last veterinary visit,• recognize and remove obstacles inside your home, in outdoor spaces, and in loading, unloading, and riding in vehicles.Kate also provides the pep talk you need when working with and loving a mobility-challenged dog.Your dog’s quality of life is important. Sit. 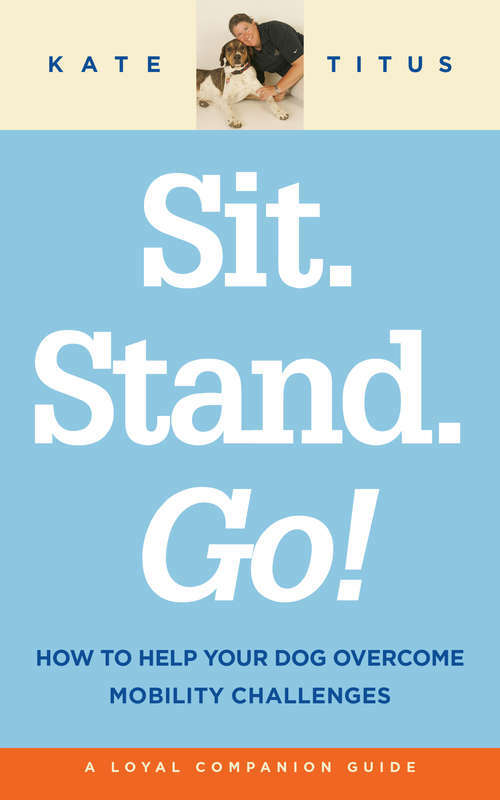 Stand. Go! is applicable to dogs of all types, including smaller dogs like Yorkshire Terriers and Beagles, and larger dogs like Labrador Retrievers and German Shepherds.Kate Titus is a Certified Canine Fitness Trainer (CCFT), FitPAWS Master Trainer (FPMT) and Certified Canine Therapeutic and Sports Massage Therapist (CTMT, CSMT). She provides massage, exercise and mobility solutions for dogs at her facility, A Loyal Companion Canine Swim and Recreation Center, in Tucson, Arizona. Kate also lectures to groups on fitness, massage, and senior dog mobility issues. Sit. Stand. Go! – the first in the Loyal Companion book series – allows Kate to share her expertise with loving dog owners like you around the country and around the world.Are you ready to join Kate to learn more about canine mobility and help restore your dog’s quality of life with Sit. Stand. Go! today?